Video demo: Alexandr Na Yun Kin. "Tonkaya Ryabina" (Thing Rowan-Tree). Dramatic fantasy on Russian folk song. Video demo: A.Na Yun Kin. "Tonkaya Ryabina" (Thing Rowan-Tree). Dramatic fantasy on Russian folk song. Video demo: Alexandr Na Yun Kin. "Pcholochka Zlataya" (Golden Little Bee), joke-piece on Russian folk song. Video demo: Alexandr Na Yun Kin. "Na Zare Bylo, na Zorenke" (It was in the Dawn), lyrical picture on Russian folk song. Video demo: A.Na Yun Kin. "Pod Oknom Cheryomukha kolyshytsya" (The Bird Cherry Tree Wavers under the Window). 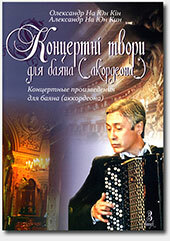 Concert fantasy on Russian folk song commemorating Vyacheslav Chernikov.